The Asian Studies program brings together an interdisciplinary group of faculty, staff, and students devoted to the study of China, Japan, Korea, Southeast Asia, and South Asia. Offering a minor and a major, the program combines study of an Asian language (either Chinese or Japanese) with non-language courses in literature, history, philosophy, political science, sociology, and art history. With over half the world’s population and quickly growing economies, knowledge of Asia and Asian languages will help prepare you for the wide range of careers in which international exposure, knowledge, and cultural understanding are important. Asian Studies is an excellent focus for a liberal arts education. Asia has over half the world's population and its economies have grown faster than those of any other region of the world in recent decades. Asia is home to a rich variety of cultures, languages, economies, and political systems and is of great importance to the United States. Five major American wars (the Philippine-American War, World War II, Korea, Vietnam, and the War in Afghanistan) have been fought in Asia. The size of the continent's population, combined with strong economic growth trends, ensures that Asia will become increasingly important during students' lifetimes. Furthermore, intense study of non-Western languages and societies gives students a comparative perspective for understanding their own Western language and society. An Asian Studies major or minor is particularly appropriate at Purdue. Over 7,000 students from nineteen Asian nations make up eighteen percent of the total student body at Purdue. Twenty-two Asia-related student groups at Purdue welcome students from all countries and provide a marvelous way to meet students from different cultures and backgrounds. 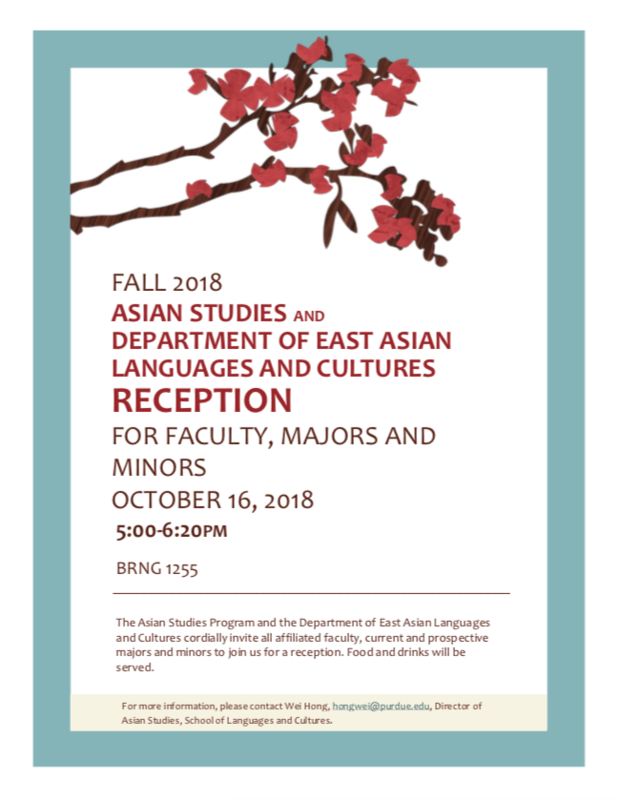 A major or minor in Asian Studies gives students a foundation for graduate work in the humanities, social sciences, business, law, or journalism. Knowledge of Asia and Asian languages will prepare students for the wide range of careers in which international exposure, knowledge, and sensitivity are important.